Product structure – a hierarchical graph of assemblies and parts, and references thereof with specific names and transformations. B-Rep (Boundary Representation) – exact geometrical description (points, curves and surfaces) along with connectivity information (vertices, edges, faces, shells and solids). CAD Exchanger is based on the strict detailed geometrical data model which provides complete description, including 3D model space representation consistent with 2D representation in surface parametric spaces. Geometrical elements support various representations: elementary (lines, circles, ellipses, planes, cylinders, etc), free-form (Bezier, B-Splines), and procedural ones (offsets, revolutions, extrusions). Meta data – these include names, layers, identifiers or various user-defined properties attached to product structure elements. These also include so-called validation properties (e.g. bounding box, surface area, volume, center of gravity) used to validate quality of conversion in a receiving system by comparing values stored in the exchange file with values recomputed on the converted model. Visual attributes - colors, materials, line thicknesses and styles, and alike used to compute visual appearances of the 3D models. Import or export of large 3D models can often impose long conversion time. To improve user experience in end-user applications, CAD Exchanger SDK provides progress status support what allows to update graphical progress bar or any other widget in the application UI. The SDK also enables parallelism and other performance boost features. 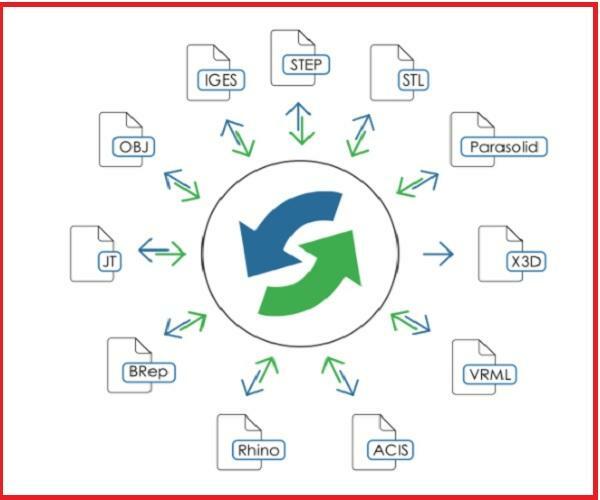 CAD Exchanger supports most broadly used CAD formats including IGES, STEP, JT, Parasolid, ACIS, STL, VRML, X3D, BRep. Depending on the format contents and specificities conversion across formats may be either bi-directional or uni-directional. For instance, formats capable to store polygonal data only (e.g. STL or VRML) are primarily used as output formats, while feature-rich formats (such as STEP or JT) support both import and export. Although most often, the user can trust default parameters, CAD Exchanger offers a set of parameters to fine-tune conversion process. This set includes common and format-specific parameters, such as support of parallelism, format flavors (binary or text), target format version (e.g. of IGES, ACIS or Parasolid), support of external references (in JT or STEP) and so on. For some complex formats CAD Exchanger supports sophisticated workflows which allow to create more responsive user application GUI. This includes step-by-step product structure import, delayed loading of heavy-weight BRep and/or polygonal representations, parallel conversion of multiple parts, filtered export and so on. 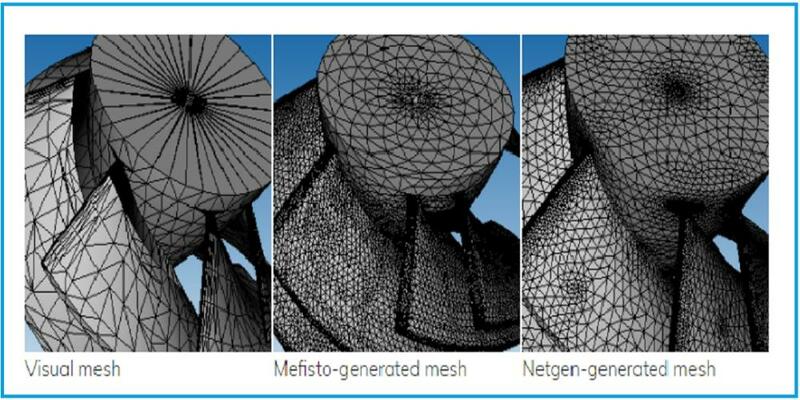 To compute polygonal representations from B-Rep CAD Exchanger provides various meshing algorithms, tailored for visualization and finite element analysis. They offer different trade-offs between performance and triangle quality depending on target usage and provided parameters. Visualization meshers are faster and can create different triangulations depending on requested granularity, chordal and angular deviations. Computational meshers suitable for FEA accept more parameters defining min and max size, element size growth policy, various heuristics and other.